Adding a dog to your family can be an exciting event, and should be a well thought out decision. Although pets can be expensive, there are ways to manage the costs effectively. While the fancy doghouses that you can find in pet boutiques are attractive, there is no need to spend a month’s paycheck on Fido’s crib. You can make a perfectly serviceable doghouse yourself out of a single sheet of plywood. Use a circular saw to cut the sheet of plywood into the following pieces: 21 by 34 inches (bottom), 27 by 39 inches (top), 23 by 24 inches (back), 23 by 24 inches (front), 24 by 34 inches (side), 24 by 34 inches (side). Discard the small leftover piece of wood, or save it to make a decorative sign with your dog's name to hang on the finished house. 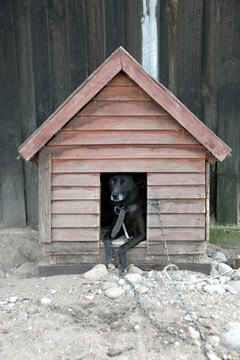 Create a door for your doghouse. Measure 3 inches from the bottom edge of the front piece and mark with a pencil. Measure 4 inches in from the left side and make a mark. Measure 4 inches in from the right side and make a mark. Use the marks as a guideline for your straightedge as you draw a 10 by 16-inch rectangle. Use the circular saw to cut out this rectangle for the door. Line up the back edge of one of the side panels with the left or right edge of the back panel. Nail the panel into place by hammering nails along the length of the side panel, either diagonally through the corner or up through the back panel into the edge of the side panel. Place the second side panel and attach it to the back panel in the same way. Lay the front panel into place and nail it securely by hammering galvanized nails along the lengths of both side pieces where they overlap the edges of the front panel. Set your wooden frame on top of the bottom piece and nail around the bottom perimeter into the edges of the bottom panel. Use two to three nails on each side. Place the flat-top panel into place and hammer two to three nails into the edges of each side panel, the back panel, and the front panel to secure it. Pipe construction adhesive along the edges of your doghouse and allow it to dry completely to provide some weather proofing.